I’m not one for politically fueled documentaries (I attribute this to The Michael More Effect) and much to my dismay the global warming issue is a political one. 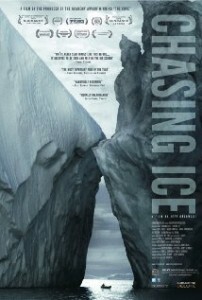 As a result Chasing Ice is a political film, but when viewed strictly as a nature documentary, the footage that renowned nature photographer James Balog captures over a 3 year period is nothing short of astounding. He trains a few dozen nikons on various glaciers around the globe and documents their erosion through means of time-lapse photography. The stills are beautiful while the moving images are breathtaking and undeniable. It’s the video footage however, of the largest iceberg calving ever recorded by a couple of his assistants at the end that proves to be most impressive. The size of Manhattan breaks off right before your eyes and slides into the ocean. Unfortunately I saw this on a small screen with a subpar sound system at an art house theater. You can see for yourself on an even less impressive media with this link. I look forward to getting the DVD when it becomes available and pumping up the volume in my living room. My poor dogs, but this might just be the most spectacular natural event I have seen on screen. Since this is a political pic and the Academy is what it is, look for Chasing Ice to get a nomination this year and open at a theater near you before it’s over. It’s already being called The Cove, but for ice, at least by me. Posted on Thursday, December 13th, 2012 at 1:28 am and is filed under Reviews.